Covering your baby in sunsmart clothing is the best way to keep them safe from the sun's UV rays. For many Australian families, taking the kids to the beach for the day is a rite of passage and a much-loved way to escape the summer heat. However, for parents of babies under twelve months, there’s a few extra levels of precaution that need to be taken to make sure your little one is safe from the sun’s damaging rays. Babies have thin, sensitive skin that can burn easily, so it’s important to take extra steps to minimise their time in the sun. 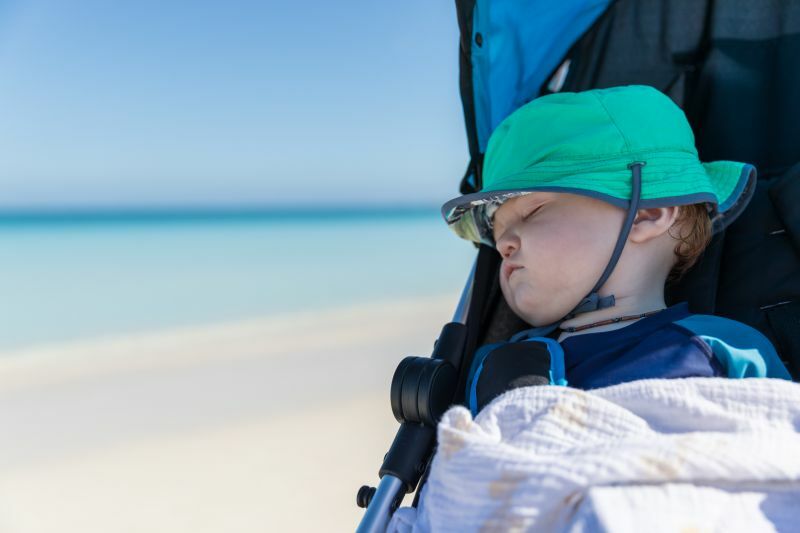 The Australian College of Dermatologists and Cancer Council Australia recommend that babies under 12 months are kept out of direct sunlight when the UV Index is three or higher. Exposure to UV radiation during the first 15 years of life greatly increases the risk of developing skin cancer later in life. The simplest rule to follow when planning outings for your baby is to remember that there’s no sun safety practices that are as effective as keeping your baby out of the sun. This doesn’t mean you need to stay in the house from dawn until dusk and cover your windows with block-out blinds, but it does mean thinking through how you can best protect your baby from UVR exposure. Using the Sun Smart App is a good way to get accurate readings of UV radiation. For example, you might head to the beach early or late in the day and arrange catch ups in parks and cafes you know have plenty of shade. Make sure you dress your baby in clothing that covers as much skin as possible and put on a broad-brimmed, bucket or legionnaire style hat to protect baby’s face, neck and ears. 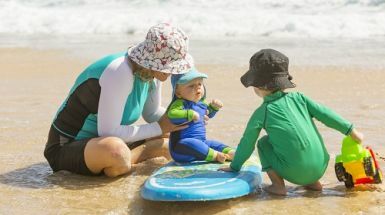 The Australasian College of Dermatologists does not recommend the widespread use of sunscreen on babies under 6 months of age, as their skin is very sensitive and may be more likely to suffer a reaction. For babies older than six months, sunscreen should be used as the last line of defence after avoiding direct sunlight. It should be applied to those small areas of exposed skin that are not covered by a wrap, clothing or a broad-brimmed, bucket or legionnaire style hat. Choose a broad spectrum and water-resistant sunscreen made specifically for babies or sensitive skin with a SPF30 (or higher) rating. If it’s your baby’s first time wearing sunscreen or you’ve just changed brands, apply a small amount to the inside of your baby’s arm for a few days to make sure his or her skin doesn’t react. Sunscreen should be applied 20 minutes before going outside and reapplied every two hours, or more often if it has been wiped or washed off. When dressing your baby, check to see if clothing has a UPF rating. Where possible choose clothing that has a UPF rating of 50 or an excellent protection classification. The UPF rating indicates how well the fabric blocks UVR from the sun - the higher the rating the more UVR gets blocked by the material and the less exposure your baby’s skin will receive. The recently updated Australian/New Zealand standard for sun protective clothing has three protection classifications depending on the amount of solar UVR blocked. Each classification has corresponding UPF ratings. A UPF rating of 15 is minimum, 30 is good and 50 or 50+ is excellent (PDF 320kB). For clothes that don’t clearly display a UPF rating, look for fabrics that are tightly woven, as these will offer a better degree of protection for your baby. A loose fit will make sure they’re still cool and comfortable on a hot day – you may look to dress them a size up to make sure the clothes are loose and breathe well on a hot day. Wearing a hat with a broad brim can reduce UV radiation to the eyes by 50 percent. Pick a broad-brimmed hat, bucket hat or legionnaire hat to make sure your baby is well-covered. Remember baseball caps don’t offer much sun protection, so they’re not recommended. Straw hats with narrow brims also do little to protect your baby’s eyes, face and neck and should be avoided. For young babies, choose a fabric that will crumple easily when they put their head down. Think about size of the hat in relation to your baby; chose one that is comfortable and doesn’t obstruct vision or hearing. Hats that can be adjusted at the crown allow you to ensure it fits your baby comfortably. If the hat is secured with a long strap and toggle, ensure it has a safety snap, place the strap at the back of the head or trim the length so it doesn’t become a choking hazard. If you’re headed to the beach, a portable shade tent is a great way to provide some extra sun protection for your bub. It’s not a guarantee of sun safety though – remember that dangerous UV rays will reflect back off the sand and water so your baby’s skin can still be damaged. Even if your baby is kept under a sun shade the whole time you’re at the beach, you’ll still need other precautions like a long sleeve rash shirt. Sun safety is something to keep in mind when choosing a pram. Look for a canopy that can cover the whole pram and includes a mesh section and a shade fabric section. The fabric section should be UPF 50+ to ensure it’s blocking UV radiation. While it can be tempting to cover your baby’s pram in a blanket to keep the sun’s rays out, remember that it can be up to 15 degrees hotter under the canopy of a pram than it is outside – and this situation only worsens when you put a blanket over the pram. Using light muslin rugs as a barrier is also not recommended, as they do little to block the sun’s harmful rays. It’s important to provide as much shade for your baby while in the car as possible. Look for a sun shades with a high UPF rating that can be attached to the window, or just hang a towel or blanket over the window on the side of the vehicle where your baby’s capsule or car sear is positioned to block the light completely. You could also consider having the windows of your vehicle tinted as this can reduce the amount of UVR penetrating the glass by over 99%.